Busy, working parents face many hurdles in that early morning rush to get their little ones out the door. One of the biggest challenges? The daily packing of school lunch. What to make? Will they even eat what we make or simply go on a hunger strike until we meet their demands – a lunch of nothing but popcorn and fruit roll-ups? We have an idea to both take some of the pressure off yourself and to give your kids more responsibility: have them start making part of their lunch. 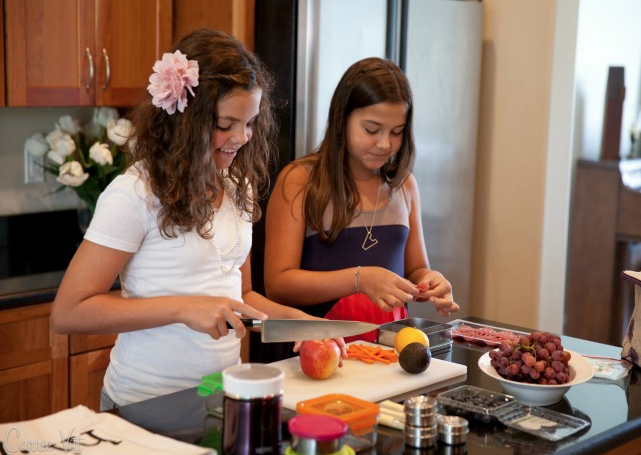 You may have heard that the more kids help with shopping and cooking a meal, the more likely they are to eat it. Let’s test the theory out! Take the kids shopping. Give them choices in the produce section for the upcoming week’s lunches. Shop the bulk bins and have them pick out the type of dried fruit, trail mix or grains they want to try. They just might surprise you! Have the right containers for the job. Many kids like storing their lunch in multiple containers. Imagine grapes in one container, cheese cubes in another, carrot coins and cherry tomatoes in yet another, and hummus and pita triangles on the side. The next day it will be a different combination. Prep extra staple ingredients while making dinner. Make another chicken breast for shredding, slice more bell peppers, or cook another cup of rice or greens for your child to incorporate into lunches. Avoid the morning rush hour. After dinner, start an assembly line on the dining room table, which may be easier for smaller kids to work on than counter tops. Lunchbox Quesadilla is an easy make-ahead lunch that older kids can prepare in one pan, and it’s a delicious way to use up leftovers. Deli-style rollups with ham, sliced chicken, or turkey. Easy and bread-free for a change of pace. Tuna or egg salad with whole grain crackers. Make a rice bowl Start with brown rice or quinoa (or both). Add a protein such as leftover chicken or cooked beans. Add veggies. Top with a sauce or dressing. Do the dip. Have your child package up single servings of salsa, dip or hummus and grab veggies, crackers or pita chips for dippers. Avocado, Lettuce and Tomato Pita Pockets packs whole grain pitas with a mixture of greens, tomatoes and mashed avocado for a satisfying and colorful midday meal. Pasta Salad using Leftovers Add veggies and voila! Apple Sandwiches with Granola and Peanut Butter Use Sunflower spread instead for a great nut-free alternative. Don’t forget the apple! They can be sliced at home and held together with a rubber band to decrease browning from oxidation. While at first, you’ll need to be close at hand, making sure they’re packing the essentials (protein, fruit, veggies, whole grain, etc.) and to take over any sharp knife or stove activities, we believe the future payoff is worth the initial time investment. ← How do I choose a toothpaste?